mig33 is about to unveil a new Developer program for developers and brands that want to build social games and apps for her 50 million registered users and thriving virtual economy. The Developer Program is a joint initiative by our company, and also both East Asian social networking services: Japan’s GREE and China’s Tencent QQ, valued at US$2.5 billion and $43 billion. The launching event will be attended by our CEO and co-founder Steven Goh; our Vice President of Business Development Chris Chandler; and Director, Head of International Alliance Division at GREE Daisuke Kobayashi. Developers and partners alike will gain a better insight into our basic technical architecture, the Developer Program, and the opportunities made available by our partnership with GREE. 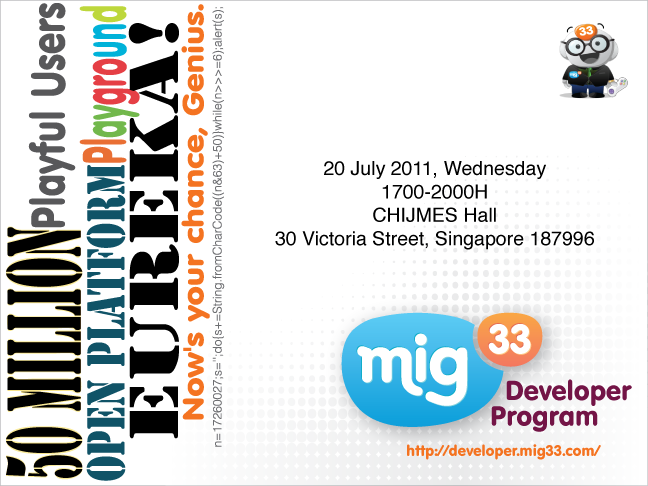 If you are a developer or have interest in apps whether it is business or development related, feel free to drop by. You can RSVP over at Flickevents .